There are plenty of apps out there that claim to clean your computer and get rid of the junk, but the latest release of CleanMyMac does that in a quick, attractive looking package. The new version, released today, sports an attractive user interface and has been optimized for OS X Yosemite. 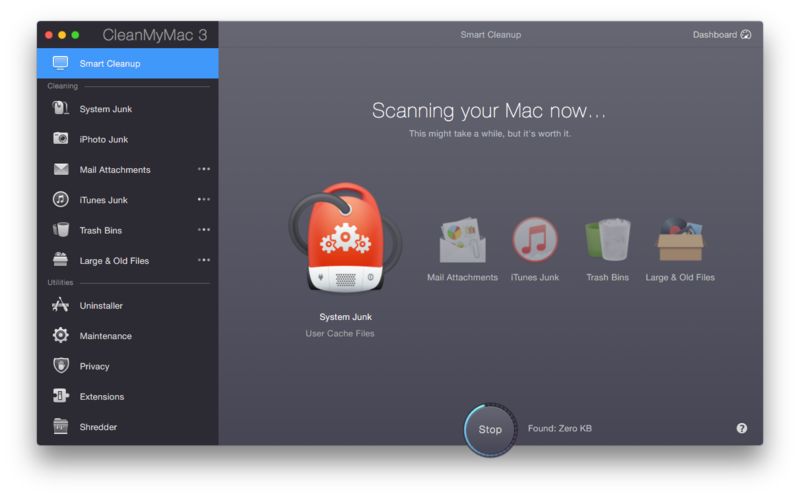 You can either run single scans, like ‘iPhoto junk’, or run a scan across everything supported by the app. Once it’s completed, you’ll get a list of how much space can be saved if you move forward, or you can drill down into further options to be a little more selective. On the very first run for my Mac, which I’ve had for about a year, CleanMyMac picked up just over 30GB of space I could save. Another machine I tried it on had over 50GB to clean. It wasn’t monumental, but it’s a decent chunk of space, particularly on machines with smaller hard disks. One handy feature is the “large and old files” scan which looks for files that haven’t been accessed for a long time or are taking significant amounts of space and helps surface files you’ve long forgotten about. There are also a number of smaller utilities onboard, such as an uninstaller that removes caches and other files often left behind, a maintenance scan that looks for system issues and an extensions browser that surfaces add-ons that you might not know are still around. CleanMyMac 3 usually costs $39.99 but is available for a discount for a limited time during launch at $19.99, which is worth it if you don’t want to spend time hunting around your computer to save some space.